As Nigeria grapples with a foreign exchange crisis, one person stands out in the scramble to obtain hard currency: Aliko Dangote, Africa’s richest man. When the government restricted the supply of dollars in June 2015 to prop up the value of the Nigerian naira, firms owned by Dangote landed a healthy share of dollars available at the cheap official rate, a study by Reuters shows. Reuters examined foreign currency transactions made during an 11-week period in March to May this year. Over that time, Dangote businesses were able to buy at least $161 million in hard currency from the central bank. That was around nine percent of all the hard currency the bank sold over the period. In a single week in March, one dollar in every eight went to Dangote companies. There is not enough data to see how that stacks up with the companies’ share of foreign trade. Compared with buying dollars on the more expensive unofficial market, though, Dangote companies benefited to the tune of about $100 million. The wrangling for dollars highlights Dangote’s pivotal role as Africa’s biggest economy tries to diversify away from oil. Over the past year, Nigeria pegged its currency, the naira, to the U.S. dollar at an official rate of 197-199 naira. The central bank doled out dollars at the official rate to companies it deemed strategic to the Nigerian economy. Until June 20, when the bank abandoned the peg, anyone else had to pay a lot more on the black market. Dangote’s purchases were entirely legal, and some economists say the 59-year-old deserved such special treatment because he has promised to build a much-needed oil refinery. He also has a track record helping Nigeria become more self-sufficient in cement and food. Dangote Group, the parent firm, declined to comment. Dangote Cement said it had received enough dollars. “We believe that we are being treated fairly and we do not receive preferential treatment,” Chief Financial Officer Brian Egan said by email. The central bank did not respond to written requests for comment. Reuters’ calculations are based on foreign exchange purchase data which the Nigerian government required banks to publish. 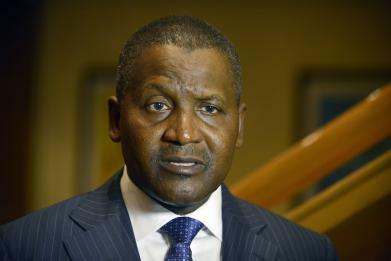 Reuters examined every transaction that Dangote’s companies made between March 1 and May 13. One newspaper, This Day, calculated a weekly total of all the published official transactions. Reuters used this total to analyse Dangote’s share. It is difficult to assess whether Dangote companies received more cheap dollars than anyone else because data for all currency transactions is not available. In the period Reuters analysed, the average black market rate was around 320, according to AbokiFX, a Lagos financial company. The difference against the official rate equated to about 20 billion naira ($101 million). Charles Robertson, global chief economist at Renaissance Capital in London, said Dangote got more hard currency than other firms because his plan to build a refinery will help the government end fuel imports, which cost Nigeria some $6 billion annually. “A lot of drain on the foreign exchange is from the need to buy imported fuel,” he said. “Getting the refinery going will require a lot of investment and imported goods. The collapse in the oil price has hit Nigeria’s revenues hard, pushing it into its worst economic crisis for decades. Crude oil and gas revenues bring in 90 percent of its foreign currency earnings and fund 70 percent of the state budget. At the same time as collecting lower revenues from crude oil sales, Nigeria has also had to spend billions importing refined products because it lacks refining capacity. Africa’s biggest economy contracted for the first time in at least 12 years in the first quarter of this year, and state governments are struggling to pay public servants. After the central bank abandoned the currency peg, the naira tumbled 30 percent against the dollar in a single day. President Muhammadu Buhari, a former military ruler who was elected to office in March last year, has made it a priority to fund investments which can help make the country more self-sufficient in everything from food to energy. Buhari often uses the slogan, “We must produce what we eat.” Last month, he said the central bank would give firms which helped to diversify the economy “incentives,” without saying what that meant. Buhari’s office declined to comment for this story. Atedo Peterside, chairman of Lagos-based Stanbic Bank, told a conference in February that the peg had guaranteed “huge windfall incomes” to those lucky enough to get dollars allocated at the official rate. Some speculators would buy dollars at the official rate and sell them for a quick profit on the parallel market. In January, Central Bank Governor Godwin Emefiele said the bank would assist the Dangote Group to access foreign exchange to facilitate its refinery project, which will be the country’s first private oil refinery and is due by 2018. Emefiele also said the bank would help companies that boost local food production. Muda Yusuf, a spokesman for the Lagos Chamber of Commerce, said the central bank’s allocation of hard currency gave businesses only 20 percent of what they needed to operate. Even state oil firm NNPC had to ask big international oil firms for loans worth $200 million to fund fuel imports, according its Managing Director, Emmanuel Ibe Kachikwu. In a February interview Dangote’s brother Sani Dangote, Group Vice President, said the firm was not getting 100 percent of its foreign exchange needs. “We’re getting some amount to make sure the industries keep going,” he said, adding that the firm’s sugar refinery was running at 60 percent capacity. But Dangote, whose businesses refine sugar and produce cement and mill flour, continued to expand. He pushed ahead with plans to build the $12 billion oil refinery, a gas pipeline across West Africa, a tomato plant and farms in Nigeria to produce one million tonnes of rice. Reuters’ analysis shows that about 80 percent of Dangote’s dollar purchases during the 11-week period were for the import of equipment and raw materials for his agricultural, sugar, cement and food companies. Technically, commercial banks decided how to allocate dollars. But executives at import firms say the central bank played a big part. Competition among industrial bosses for the central bank’s attention was on display in April at the funeral of Governor Emefiele’s mother. Dozens of business leaders attended the service, including Dangote and the CEOs of most big banks. Business leaders, dressed in traditional robes, left their bodyguards behind as they crammed into the small town of Agbor deep in the Niger Delta. Since founding his business in the 1970s, Dangote has been close to a series of presidents, both military and elected. He was an economic adviser to Buhari’s predecessor Goodluck Jonathan, who ruled from 2010 to 2015. Although Dangote built his business under Jonathan’s People’s Democratic Party, he also had links with the opposition. On election night in 2015, when Buhari ousted Jonathan, a smiling Dangote was pictured next to Buhari at a house in Abuja as results came in.